Confession is offered at the new church location at 1600 W. Rt 66, see photo gallery for map. Saturdays 9-10:30 am & Wednesday Evening 5-6pm. Great news ! The Adoration Chapel has moved to its new home at the new Church! Please contact Valerie at 853-4172 or Becky at 853-7976 for information. Our Annual Parish Open Golf Tournament is a fundraiser and 'fun' event for all. 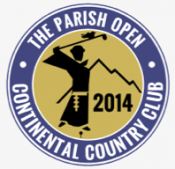 This year it will be held at Continental Country Club on Saturday, June 21st, 2014. Events start at 8:30 am with the Shotgun start. If you have any questions, or would like to be a 2014 Sponsor, Volunteer or Player, please contact us by phone at (928) 362-1432 (message line) or email us at info@parishopen.com. CLICK TO VIEW MORE to get a QR code which you can scan for more info. We look forward to seeing you there on June 21st! Access this week's letter from Fr. Patrick Mowrer to the community! Check our Articles for a treasury of past letters from Fr. Pat. Interested in becoming Catholic? Do you know somebody who might wish to become Catholic? The Rite of Christian Initiation of Adults (RCIA) process is designed for adults who are either unbaptized or baptized in another faith and wish to become Catholic. We begin with casual inquiry sessions which are held in the summer at St. Pius X, 2257 E. Cedar. Call (928) 779-1341, and ask to speak with Barbara Nabours for more information. RCIY (Rite of Christian Initiation for Youth): RCIY is for all middle and high school teens in need of sacraments. Our sacrament preparation program will meet before Edge/Life Teen in the spring – Edge/LT attendance is required for the full year. Sunday Mass attendance is a must. Register RCIY when you register for LT or Edge. Welcome to the San Francisco de Asís Parish Religious Education Program! Whether you are coming for the first time or have participated in the past, we are pleased to have you with us. It is our hope that our families will find support and take advantage of all our San Francisco de Asis Parish community offers, as we work together to guide our children toward a fuller encounter with Christ and a life of discipleship. Faith formation is a life-long process. This process begins at home with parents being the child’s first and most important catechist. Parents know the importance of attending Mass each week with their children. God calls us to His altar and there is no substitution for the graces that we receive at Mass, which is the source and summit of our Catholic faith. At San Francisco de Asís, a catechetical program for instruction is provided for children and youth of all ages. The R.E. program for children in grades K-5 is the first part of this process. We encourage children to begin R.E. classes in their Kindergarten year of school, in order for them to be better prepared to receive their Sacraments of 1st Reconciliation, Confirmation and 1st Communion at the appropriate time. Sacramental prep students are mainstreamed into our regular catechetical program. Please see our information page for the Sacraments of 1st Reconciliation and Confirmation and 1st Communion for a more detailed explanation of our program. While The Sacraments Program is a part of our R.E. program, religious education continues even after your child has received the sacraments. We also offer an RCIC program for children who are in grades K-5 and are unbaptized. The catechetical program currently in use has been developed for children in accord with their age and readiness levels. It is our expectation that children would not come to R.E. classes for the sole purpose of sacramental preparation. Our program is structured in a way that the grade levels build upon each other. It is our hope that you will accept our invitation to be a part of our religious education community throughout your child's school years. Each year, our R.E. program offers instruction on Mass, Prayer, Scripture, Discipleship and gaining an understanding of our Catholic beliefs, through the use of our Call to Faith Program. The Venture Series offers more in depth instruction on putting our faith into action in today’s world. Each week children will explore the upcoming week’s gospel during “Breaking Open the Word”, sing, play games, and explore art and storytelling in a safe and faith filled environment. R.E. classes are offered on: Monday 4:00 p.m. – 5:15 p.m. Monday 6:00 p.m. – 7:15 p.m. Tuesday 4:00 p.m. – 5:15 p.m. Tuesday 4:30 p.m. – 5:45 p.m. (Spanish) All classes take place at the SFdA School. Registration forms can be downloaded on this website or found in the parish office. There are MANY opportunities for volunteering in our Children’s Ministry Programs. If you have more in depth questions or would like to volunteer, please call Cathy Carlsen at the Parish Office. Our hope is to work together with families to help them make Christ a priority in their children’s lives as they grow into the people that God created them to be. We look forward to creating a lasting relationship with your family through the love of God. Edge (Middle School): Serving 6th-8th grade teens. Edge meets Monday nights from 6:30-8pm at St. Pius. Registration is $45/student or $75/family. Every semester, Edge unpacks a catechetical theme in a relevant way through small groups, teaching/testimonies, worship and prayer, media and games and activities. Middle school teens are not too young to make a commitment to Christ and the Church - give them the tools they need to live that commitment. Life Teen (High School): Serving 9th-12th grade teens. Life Teen meets Wednesday nights from 7-8:30 pm at St. Pius X. Every month, our nights rotate to provide service, catechesis, prayer and socials (fun!) And every first Wednesday of the month, join us for Exalt, a night of worship, teaching/testimony and Eucharistic adoration. New this year, all freshman are invited to join a Discipleship group that meets monthly for deeper Scripture study and committed community. (This requires a yearlong once/month commitment; groups will schedule their meetings to accommodate teens’ schedules). Community is necessary for all Christians – let Life Teen meet that need for your teen. Parent Ministry (Moms and Dads): Serving both middle and high school teens’ parents, our new parent ministry will meet on the first Wednesday of every month from 7-8:30 pm at St. Pius. Designed to bring community, catechesis and resources to parents of teens, we hope you’ll join us on a spiritual journey alongside your kids with the help of other parents. For more information on Youth Ministry at SFDA, contact Beth Davis (Youth Minister) 928-779-1341. The door of faith is always open… Your gift to the CDA supports over 70 community and charitable organizations that assist individuals and families in need or in crisis. These organizations provide an open door to improve the lives of thousands of people across 4 Arizona counties (Mohave, Maricopa, Coconino and Yavapai). The CDA serves the needs of local communities beyond the boundaries of any one parish. As a result more people are served across communities as well as within parishes. Through the CDA, your gift impacts the lives of many * Every $27.50 provides a monthly bus * Every $43 will feed a family of four for a week * Every $75 provides an mother with a first look at her unborn baby Find your faith… Through the CDA, faith is nurtured and developed from birth through adulthood. 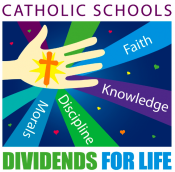 Opportunities to live and grow our Catholic faith are available through our schools, parishes, religious education programs, Kino Institute as well as other opportunities offered throughout the Diocese. The CDA also supports the education and formation of seminarians, priests and deacons. * Every $150 provides a scholarship to a Natural Family Planning course. * Every $140 will provide the funding for a teenager to attend an Encounter Retreat Share your faith… Make your gift today!